The other morning there was a small parcel waiting for me by the patio doors. 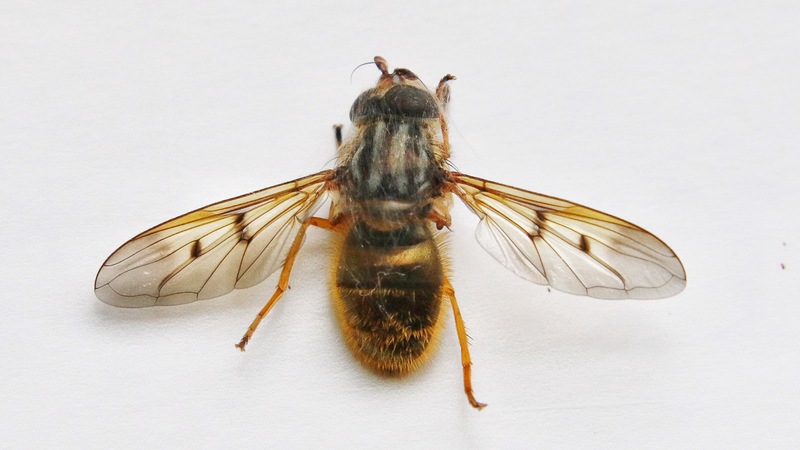 The guides say that Ferdinandea cuprea, a Hoverfly, is instantly recognisable. Well that doesn’t apply to the PC Detective Agency. I thought it was a fly. 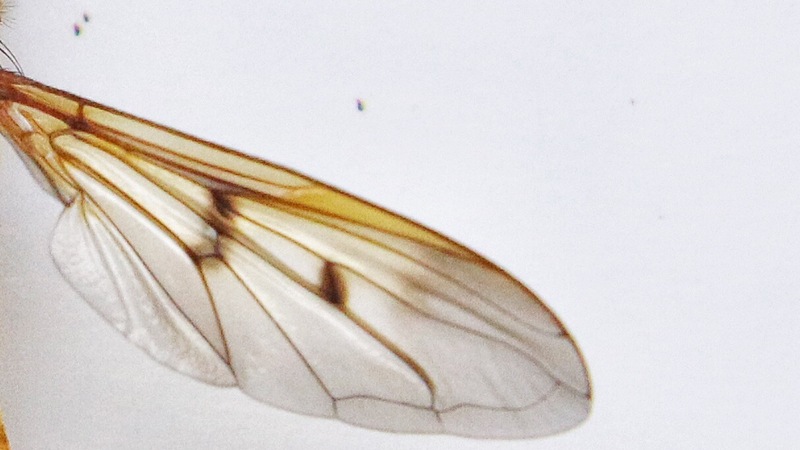 Now that bit I got right, but couldn’t find any reference to anything like this in my field guides, and so I ask the folks on the UK Dipterist Facebook Page for help. Almost instantly a reply came back that this was a Hoverfly. Now why didn’t I think of that?! I almost as instantly found it in my Hoverfly field guide. Duh! In my defence 1: I’d never seen at his before and 2: if I was pedantic I was right this is still a fly! This specimen was already dead when I found it so it was able to pose nicely for the camera. Therefore it was easy to achieve a half decent photo and it shows up the brassy colour of the abdomen and neatly illustrates how hairy these creatures are. But for me the real beauty is in the detail of the wings. The yellow/brassy ting to the leading edge of the wings, and the distinct stigmata. It is a widespread species, often found in woodland, basking on leaves or fence posts (1).On the wing between March and Oct, but with peaks in April, May and June. The larvae, which when present are often numerous, are usually found in sap runs on deciduous trees (2). They are adapted to manoeuvre into small spaces such as below bark, and remain hidden deep within the sap. The pupae usually occur under loose bark near a sap run (2). I am not sure if the filaments that can be seen on the thorax is spider silk or a fungal infection. Maybe someone can enlighten me if they read this post. First described in 1763 by Scopoli. Ball, S. & Morris, R. (2013) Britain’s Hoverflies: An Introduction to the Hoverflies of Britain. Wild Guides. Ferdinandea cuprea. 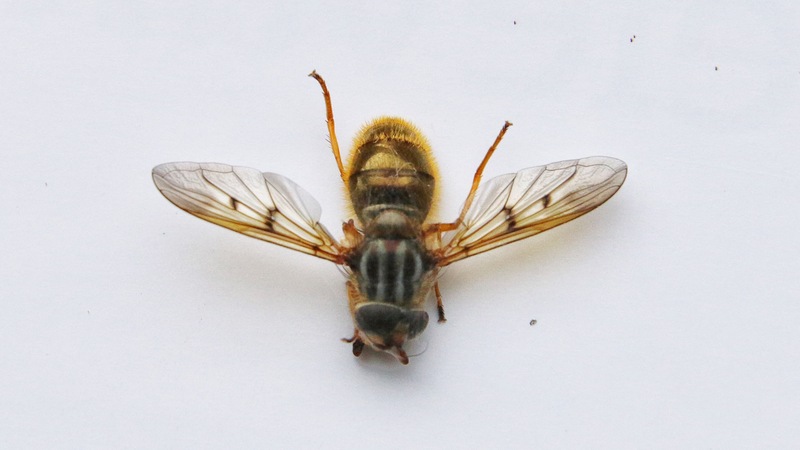 Hoverfly Recording Scheme. http://www.hoverfly.org.uk/viewtopic.php?t=140. Accessed 2016.09.12. Ferdinandea cuprea NBN Distribution Map. https://data.nbn.org.uk/Taxa/NBNSYS0000007007/Grid_Map. Accessed 2016.09.12.